Sporting elegant contours inspired by the local landscape, the Pioneer 400 stove is a perfect example of Clearview's uncompromising attention to detail and desire to build a clean-burning stove to meet, and even exceed, the most demanding specifications. Customers tell us you don't actually choose to buy a Pioneer 400, one look at this rugged and stylish thoroughbred and it chooses you! Offering a characterful presence, the Pioneer 400 will enhance the look of any interior space. Your traditional or contemporary setting will gain a spellbinding focal point giving a crystal clear view of mellow burning flames to welcome your guests, and radiating a comforting glow whilst it warms your family, keeping out winter chills and forging memories to warm their hearts. Available in Classic Black or six other tasteful colours, the Pioneer 400 features a single double-glazed door to maximise your view of the brightly burning logs. Its handle and all control knobs are fashioned from solid brass, though these highlights are also available in a stylish satin chrome if you want to create a more restrained effect. An ultra-convenient top hotplate surface will allow you to give pride of place to a welcoming kettle or coffee pot, and also offers the promise of winter soul-food treats like the aromatic bliss of slow-cooked savoury soups and casseroles. In addition, the Pioneer 400 comes with a choice of 2-, 4-, 6- or 10-inch legs, allowing you to tailor the stove profile to suit your taste and location. Definitely built to last, all of the Pioneer 400's &#39wear and tear' parts are completely replaceable, and Clearview's practical design enables easy adjustment of the door catch and hinges to maintain an efficient airtight seal. 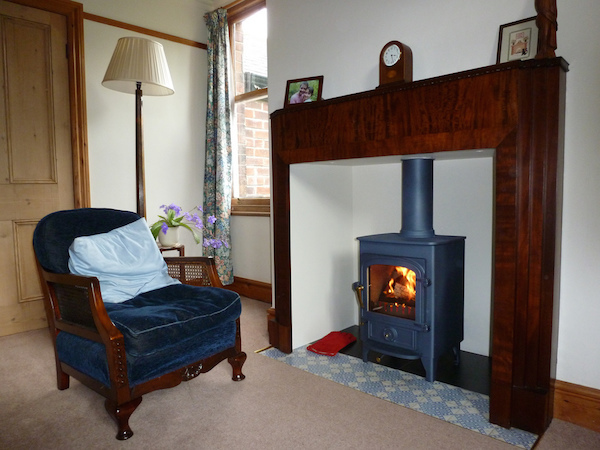 The same high-quality attention to detail and commitment to ease of use has also prompted the inclusion of adjustable levelling bolts at the base: Clearview's designers appreciate that most rustic fireplaces have uneven floors, and all stoves are at their most convenient and efficient only when properly aligned. The Clearview Pioneer 400 outputs 5kW of heat and, with an optional boiler, will also happily heat your water. Though eco-efficiently designed and approved to burn wood as a sustainable option u2013 even in smoke-control areas u2013 its multi-fuel grate can easily accommodate other fuels. Customers also appreciate the clean-burn technology which incorporates a hot air-wash system to help keep the glass clean and looking good, as well as offering reliable high-efficiency combustion which makes a vital eco-friendly contribution towards keeping our environment clean and safe too.